Welcome to ACC Football Online, a user friendly directory dedicated to helping our friends find Atlantic Coast Conference football games. We help you find the legal game streams to watch ACC football and basketball games live online. We are not affiliated with the ACC, just huge fans like you. To visit the official website of the Atlantic Coast Conference go to TheACC.com. The Atlantic Coast Conference was established in 1953 by seven former members of the Southern Conference. 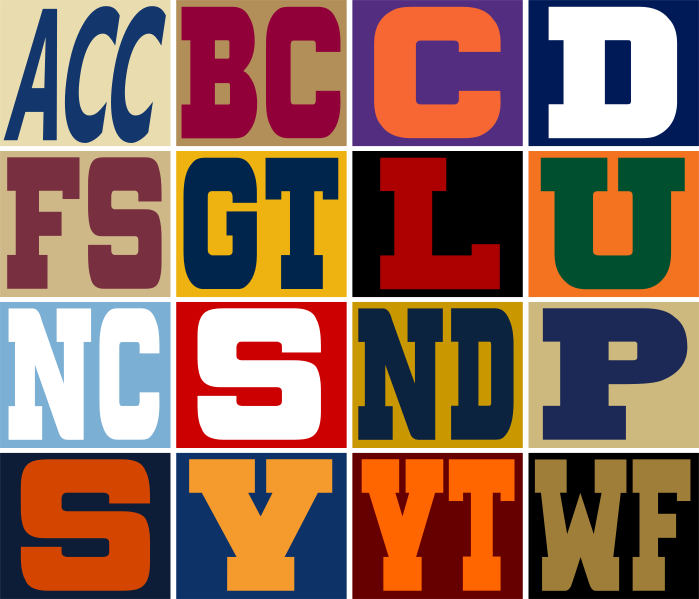 Clemson, Duke, Maryland, North Carolina, North Carolina State, South Carolina and Wake Forest were the founding institutions of the ACC. The University of Virginia was admitted later that same year. South Carolina withdrew from the conference in 1971 and was replaced by Georgia Tech in 1978. In 1991, powerhouse Florida State University joined the Atlantic Coast Conference. Later, the conference welcomed the additions of Miami and Virginia Tech in 2004. Boston College came aboard in 2005. The year 2013 saw the additions of Pittsburgh, Syracuse and Notre Dame and in 2014 the University of Louisville became in the fifteenth member of the conference. The ACC is the definitive Atlantic Coast Conference, its members span from New York to Florida. The conference now controls the most television households and highest population of any collegiate conference in the nation. With the number one basketball conference and unlimited potential in college football, the ACC is the nation’s preeminent collegiate athletic conference. The University of Notre Dame Fighting Irish are full members of the ACC, however the school competes as an Independent in football. The two division champions play each other in the ACC Football Championship Game at the end of the regular season. The winner of the ACC Football Championship Game receives an automatic bid to play in the Orange Bowl. Besides the Orange Bowl, the ACC Bowl Game tie-ins include the Peach Bowl, Sun Bowl, Music City Bowl, Military Bowl, Independence Bowl and Fight Hunger Bowl. ACC Football Online offers the fans the most up-to-date online broadcasting schedules from all of the ACC Conference schools. Find out what channel and what time your favorite ACC football team is streaming live online with our live streaming guide. Watch ACC Football Online is the number one streaming guide online helping all the fans watch live ACC football action on the Internet. We show you how to listen live to local radio play by play streams and watch ACC football games online at the same time. You can now watch ACC football games on iPhone, iPad and Macs. You can even get ACC game streams on Roku, PS4, Xbox and more if you know where to look! We compile all the legal ACC game streams and display that info in our user friendly ACC football live stream guide. Starting this season, we are compiling all the ACC live basketball streams online for your viewing pleasure. Our streaming guide contains all of the legal ACC basketball streams that we find on the Internet. We show the fans how to watch ACC basketball online legally! Our collection of live ACC basketball games streaming online is second to none – let us help you find out where to watch ACC basketball online. The ACC Network broadcasts all types of ACC sporting events live online throughout the season. You can watch ACC football games on the ACC Network online during the season. And if the hard court is your passion, you can also watch ACC basketball games on the ACC Network online for free! Get ACC baseball, soccer, softball, lacrosse, volleyball, tennis, golf and more on the ACC Network live online. We help our friends find out how to watch ACC Network online free and get the best games in the best sports from the best collegiate conference in the US – The ACC! ACC Football Online does not host any streams of the games online. We only display links to the official members and partners of the ACC and the legal ACC online streaming broadcasts. Each ACC school streams football and basketball games online. We are not affiliated with the Atlantic Coast Conference or any of its member schools. Visit the official website of the Atlantic Coast Conference.